Who inspires you: Women who have dedicated their lives to helping animals. People like Lyn White from Animals Australia, Sarah Carter from Twala Trust in Zimbabwe, Jill Robinson from Animals Asia and Emma Haswell from Brightside Farm Sanctuary in Tasmania. Best advice: Think big and follow your heart. Jill and Warren Barton knew what to expect when they volunteered to help abused horses in Egypt. They’d seen the photos of sick and dying horses and donkeys – all sunken eyes, festering wounds and jutting ribs. But being there in person. Looking into the horses’ eyes. That was something for which they could never have prepared. Every day they encountered new horrors – horses too weak to rise, donkeys with open wounds, owners whipping their beasts of burden on the streets urging their dying animals to work. Later Jill discovered many of these horses were descendants of the Australian horses left in Egypt after World War I. Devastated that these once proud horses had been abandoned in Egypt, Jill and Warren pledged to return after their four-week volunteering stint to do more to help. Bones jut from horses recently admitted to Egypt Equine Aid’s care. Dissatisfied at the standards of the shelter at which they’d volunteered, they decided to start a charity of their own. They dreamed of launching a training hospital which would not only help the horses but also provide quality clinical experience to vets – all of whom had undergone five years’ university training but few of whom had much, if any, practical experience. Jill recounts one instance in which a vet was unaware where to locate a horse’s heart to measure its heartbeat. In another instance she watched a vet inject a horse, only for it to collapse into the dust. Men surrounded the fallen animal, flogging it with whips to encourage it to rise. On rising, it would stumble and fall once more, too weak to walk despite the hail of whips raining down upon it. They dreamed of launching a training hospital which would not only help the horses but also provide quality clinical experience to vets. They rented a property alongside the desert in Abu Sir outside Cairo. The canal which abutted the property was too polluted and clogged with rubbish for the property to operate as the farm for which it was originally intended. So Jill rented it to establish on-ground facilities while Warren returned to Australia and set up the charity Egypt Equine Aid. Standing on the property, with pyramids visible in the distance and date palms and mango trees lending an oasis-like atmosphere amid the heat and flies, Jill surveyed her surrounds and made her plans. She then employed an English-speaking vet, gathered a team of grooms with whom she could barely communicate, and set to work. A donkey not far from the Equine Aid farm. The early days were the hardest. But surviving this period empowered Jill and made her realise she could do more than she thought. Still, it was tough. Not long after starting Jill encountered a particularly skeletal horse in need of care. Wounds covered most of his body, one eye was swollen shut, and he couldn’t put any weight on one foot. His body was also covered in sores from ringworm, and mange. So sick was the creature that Jill doubted he would survive. Burned out and on the verge of throwing in the charity and going home, Jill decided she’d leave her decision to the fate of this one horse, whom she named Egypt. If it survived she’d continue in Egypt. If it died she’d quit and head home. A few days later she discovered the horse laying lifeless on the ground. It was still breathing. But it was time to consider euthanasia. However, a team of grooms implored her to give it another chance. They rallied about 10 staff who helped lift the horse to his feet. And slowly, ever so slowly, he improved. “I couldn’t believe it – the bloody horse survived so I had to stay,” Jill laughs. Though it took months to rehabilitate that particular horse, its now beautiful form and shining coat makes it unrecognisable from the creature that first visited Egypt Equine Aid. 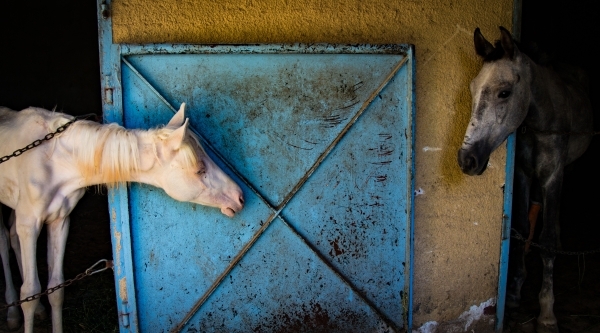 The same horse went on to work at Egypt’s first equine therapy program. “He’s now helping people with depression or post-traumatic stress disorder – he’s taught a lot of people a lot of things,” Jill says. Today Egypt Equine Aid has 20 stable boxes, and outside yards that together cater to up to 65 horses and donkeys. 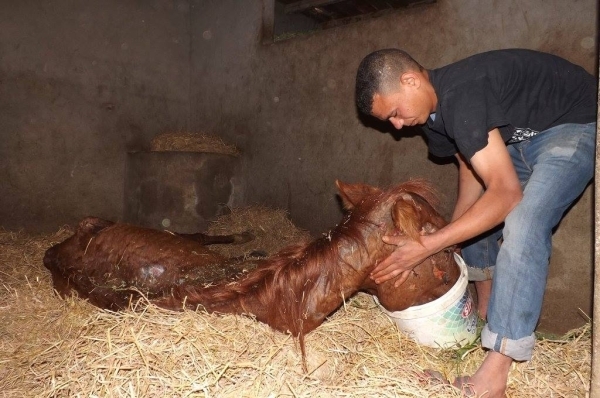 Egypt Equine Aid employs local and international vets and offers free treatment to encourage animal owners to present their sick steeds for care. It not only treats the horses and donkeys but also educates owners on how to better care for their animals. Even if the owners show little compassion for their beasts of burden, they recognise the economic sense in protecting their investments by ensuring their health. Egypt Equine Aid has now treated more than 3000 horses since it opened in July 2014. And Jill says they are closer than ever to launching the training hospital of which they first dreamed. Among the thousands of horses and donkeys in need of care, several cases stand out for Jill. She remembers one horse arriving on a particularly hot day. Flies clouded its rotting flesh and its skin fell off in chunks. This horse was too far gone to help. The owner agreed to have it euthanised. Then there was the donkey that Jill discovered on the street, pregnant, lame and pulling a cart with a heavy load in oven-like heat. Jill convinced its owners to bring the exhausted creature to Egypt Equine Aid. She was so taken with the donkey’s big heart that she offered to rehome it. While its baby was stillborn, the donkey is now growing fat enjoying its retirement. 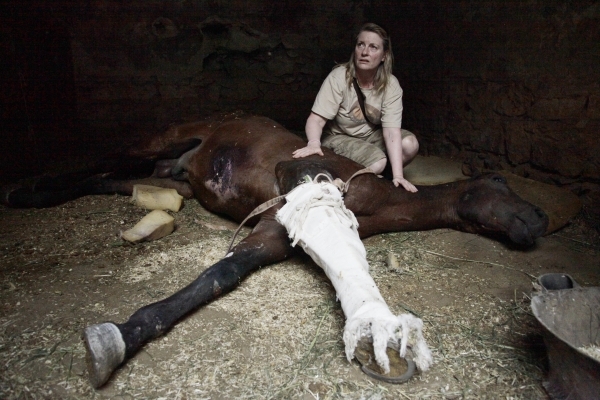 The distressing sight of a particularly sick horse in Egypt Equine Aid’s care. 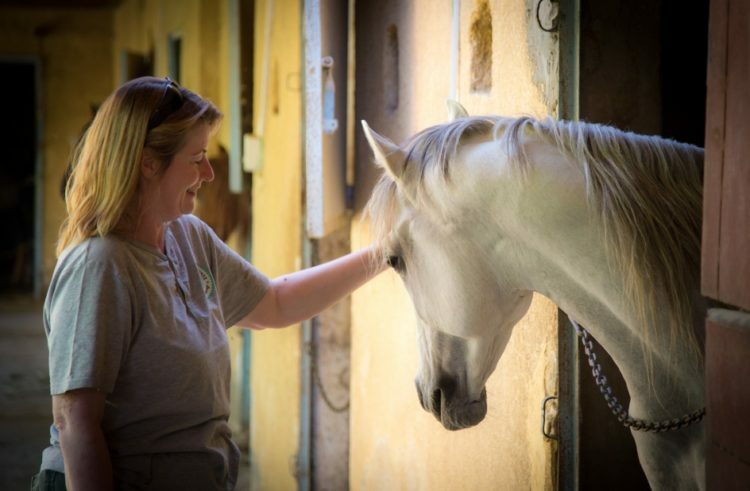 Jill is also extraordinarily proud of a program Egypt Equine Aid has introduced to train grooms and farriers. She employs two grooms at a time as trainees to learn the skills they need for ongoing employment. And she pays trainee farriers to learn the skills of the trade and secure the chance of a new life thanks to their new profession. One farrier has already completed the program and another two are in training. These farriers return to their communities to work in a higher-paying job than what they would otherwise have expected and, in the process, they pass on what they’ve learned about the proper care and treatment of horses. 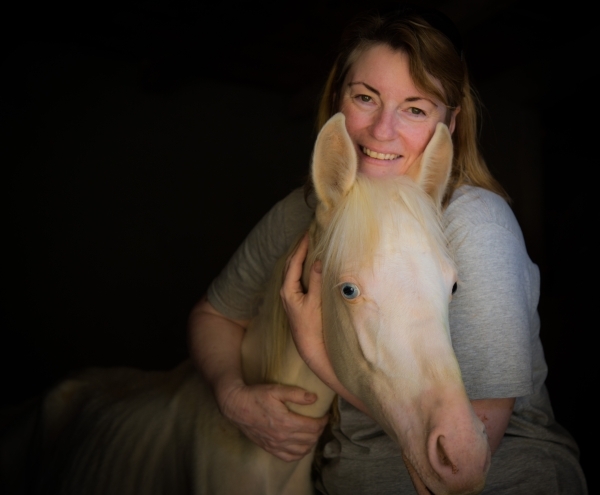 “It made me proud to see Egypt Equine Aid really making a difference not only to the horses but to the people as well,” Jill says. Along the way Egypt Equine Aid’s work has captured the interest of supporters worldwide, who help fund its work through donations, and volunteer their time and help as grooms, vets and vet nurses. Then, of course, there are the horses. Jill steals of moment of quiet with this horse in her care. You can help Egypt Equine Aid continue its lifesaving work by donating online at https://www.egyptequineaid.org/. It also welcomes volunteers, particularly trained vets and vet nurses. We thank god that Jill returned and set up Egypt Equine Aid, a shining example of horse welfare and charity. 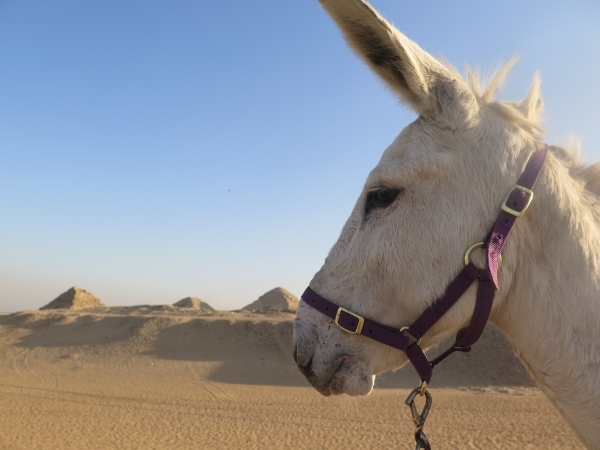 She has helped so many horses and people in Egypt and we hope they continue to expand and treat these sad horses and donkeys in such desperate need. She’s amazing isn’t she Wendy? To subject yourself to witnessing such terrible abuse, and then step up and do something about it, is so super inspiring.